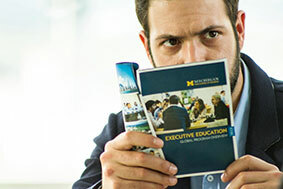 ‘321 dias en Michigan’: Doing time or earning an MBA? The new Spanish movie “321 dias en Michigan” is about a businessman who is convicted of financial crimes and imprisoned in Michigan. To hide his shame, he tells people back home in Spain that he’s actually pursuing an MBA at the Ross School of Business at the University of Michigan. Why did you decide to have Michigan be the film’s setting? Garcia: We decided that the movie’s main character, Antonio – a young, aggressive, well-heeled executive – would not admit that he was condemned for financial crimes. So instead he would try to show to the world that he’s doing an MBA. After doing much research and talking to a friend in Chicago, we were told that the University of Michigan in Ann Arbor was ranked first in the world, and we thought it was perfect. The people viewing the movie would think he disappeared off the map. Carmona: Because Michigan in Spanish has a special sound and strength that we liked very much, so it was perfect for the title. Where was the film shot, and how did you make it look realistic? Garcia: The movie was entirely filmed in a provincial prison in Málaga. We did a lot of research so that it would look like our lead actor was really in Michigan. We studied guides, shirts, cups, notebooks and brochures. Everything had to have the block ‘M’ on the blue background of Michigan. Carmona: It was filmed in an abandoned jail, so we had to clean it up to make it look like a jail. Chico Garcia plays the lead role, Antonio. What did you want to show in the movie, the possibility of humanity in prison? García: To find the soul of ordinary people in day-to-day life in a setting that is so extreme, like a prison in the south of Spain. Carmona: We wanted to show the everyday life in a jail. People are able to find their way, and they have to find themselves and gain the right for a second chance. What was your image of Michigan before and after doing the film? What is the unique characteristic of U-M reflected in your story? García: I’ve never visited Michigan, but it’s one of my aims in my life to visit the state that gave the title to my opera prima. At the end of the 80s, my cousin was studying in Flushing High School, and Michigan looked like a great place. When I discovered that the best MBA program in the world was in Ann Arbor, we didn’t think twice. Going to Michigan was our lead actor’s biggest aspiration. Carmona: The University of Michigan represents excellence, a special place reserved for the best students and professionals. But in our movie, it represents the lie of the main actor, an executive who is a corrupt thief who makes everyone think he’s a great professional, but he’s just a liar. He makes everyone believe he’s in the best university, but in reality he’s in jail. Universities like the University of Michigan should be the places where our executives and politicians should be trained, but many of them are not trained adequately and they end up in jail for corruption. When will the film be distributed in the U.S.? García: We are waiting for the full distribution in Spain. It has already won four prizes in the Festival de Cine Español de Málaga, including the public prize and the prize for best supporting actor. I hope this will give wings to the movie and it can be distributed all over the world.